If we want to attract students for history teaching, first we need to pick an interesting topic for presenting. Once we pick the topic, than we need to find the most suitable and the most attractive sources through which the topic can be presented. A properly chosen historical source can intensify the contents and helps students to remember historical processes. If we focus on teaching about the communist era as a transnational phenomenon, we have available lot of sources written ones, visual and audio-visual ones. Due to a large amount of sources, one question need to be asked: how to pick the most suitable/appropriate source? While rethinking the sources for communism the events and figures that were exclusively of importance for Slovakia were the first ones to come to our minds. For example the national heroes, politicians of national importance or nation specific political processes. After looking through the slovak history textbooks, we realized that all over the education processes the national perspective is the only one dominantly presented in Slovakia. The communism is not being look at/seen as a complex system or universal ideology that affected the life of various states and that it had many forms and representations. We realised that these very specific realia are also not a suitable ones for teaching communism in transnational perspective and it’s necessary to let the national specifications loose. That’s why we look for and use of generalities. We had to look for certain aspects of communism that, as we supposed, happened and took part in every (or at least also in few others) countries of Ostblock. Framing our thinking into these limits we’ve got from political history to social and cultural aspects of Socialist society. We’ve been also searching for a tool, which could help us to explain the ideology of communism (article 4, constitution). On the other hand as we’ve focused on the social and cultural history, these expressions of everyday life are implemented into society by state’s power. Architecture, culture, industry, it’s all linked to ideology. Our selected sources have a visual form mostly (ranging from photographies to banners). We have limited the textual sources, because of the language barrier, loose translation and meaning of the contemporary text that could shift. Texts are also more closely linked to the places and situations in which they were created and because of that it could be more problematic to transfer the meaning on the transnational level of understanding. In general the crossroad of common signs occuring in all former Soviet Union countries were the statues of Stalin. These statues are also representations of the empowerment of public space by ruled ideology. The another dimension of that photography is, that it was created day after Stalin´s death, in March 6, 1953. This day was declared as national mourning day. Among the other things the official description of that photograph reads as follow: „On March 6, 1953, the sadness also spread to our country. Both young and old people mourning. […] On Friday 6th March, from the early hours citizens, delegations, pioneers in Bratislava come to J.V. Stalin´s statue and they were laying flowers to the statue of J.V. Stalin“. To whom belongs the displayed statue? Who was he? Why was this statue built in this public place? Why the author chose that angle of shooting? As the news report describes, did displayed people come to the statue on a voluntary basis? In which countries people even today do mourn for their rulers like this? That photo is a typical example of Socialist Realism, whose main task was to show the positive aspects of socialism and to convince citizens about the positive economic and social changes and economic growth. 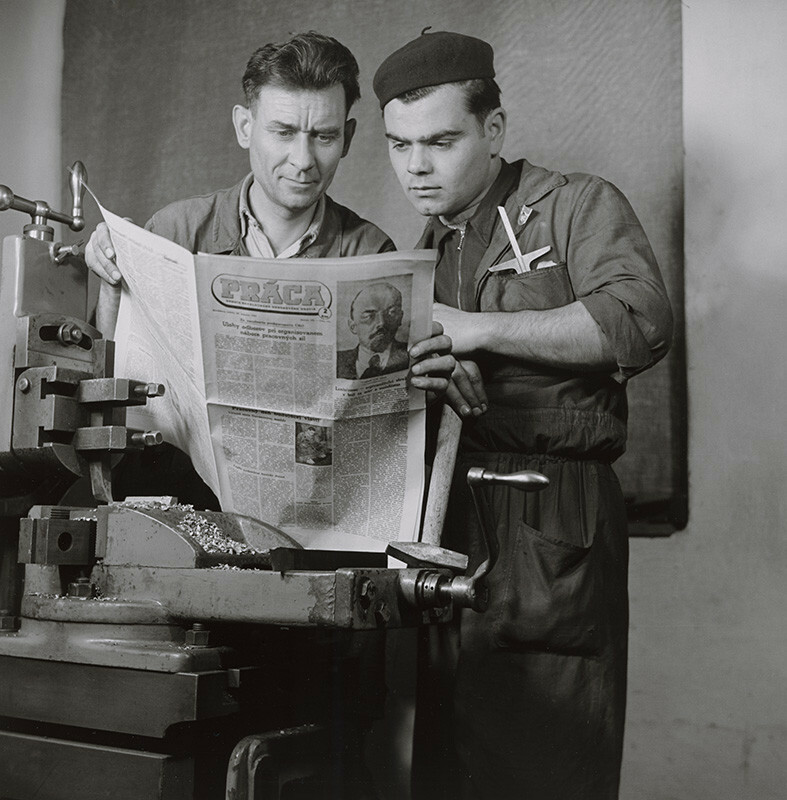 In that photograph, two workers read the newspaper called Work. Both workers pretend to be a very concentrated and serious and even though they are workers, they look exceptionally clean and tidy. Overall impression of staging completes the portrait of Vladimir Lenin at the front page of the newspaper. What objects are situated in that photograph? Do ordinary workers look like this during work? How would you describe socialist realism on example of this photo? Specific depiction of certain political figures such as Alexander Dubček would work only within Czech and Slovak context and their historical memory. Coat of arms that can be used for general analysis, but contains representations and symbols that would be understandable only for limited audience, because for example the story behind the arms of Slovakia carried by the lion would need a broad context and understanding also for Czechs and Slovaks. In this few paragraphs we tried to present our process of thinking and selection of suitable sources. We presented our main arguments why some sources we do consider to be more suitable than the others and of course it is not the final selection. This ones should serve as a starting points and inspirations for broader selection and discussions.